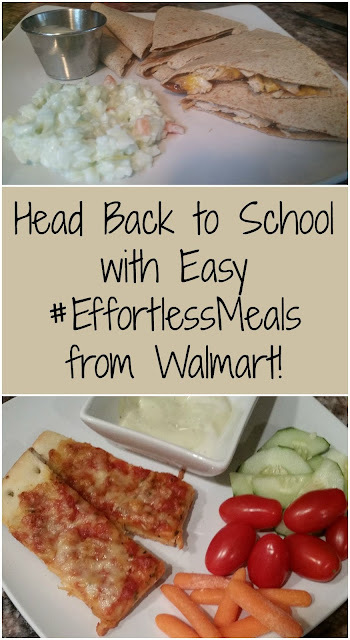 Make #EffortlessMeals Tonight with Walmart! Oh man, you'd think after a month of being "back to school", I'd get the hang of it again, but it's so hard. I feel like I'm always running around. Running from school to home, running out to the store get get whatever we've run out off, running back into the house to get dinner and bedtime done each night. I sometimes worry that I'm not being "enough" of a mom, because I'm so bogged down with errands and schoolwork, there are nights that I barely have time to make dinner, or I'm so exhausted from the day that I do't want to spend the time making a healthy dinner. Just last week, I was super stressed over the National Honor Society Induction at my school. As an adviser, I was busy. Every single night I was running out to the store to grab one more thing we didn't realize we needed. On Wednesday, I had to run in to Walmart and grab spoons for the cake we had ordered and figured I would just grab some fast food on the way home. I hate the drive thru but sometimes it's just too easy to say no to! 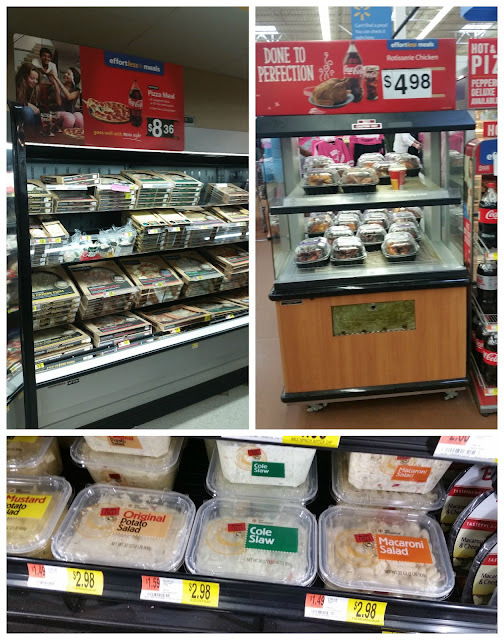 As I ran into Walmart, I was immediately drawn to the smell of rotisserie chicken and warm pizza. It's amazing how good it smells, especially after a 9 hour work day and another 2 hours of errands. When I saw the sign advertising their amazing price, I decided to forgo the drive thru and grab a rotisserie to make an easy, healthier, dinner. The pizza also smelled delicious so instead of grabbing a Hot and Fresh pizza, I grabbed one from by the deli to have on Thursday night, since I knew Thursday would be hectic also! Walmart offers an Effortless Meals option of pizza with a 2 liter of soda and while we're not huge soda drinkers, Emma loves having a special "Red Soda" on occasion. 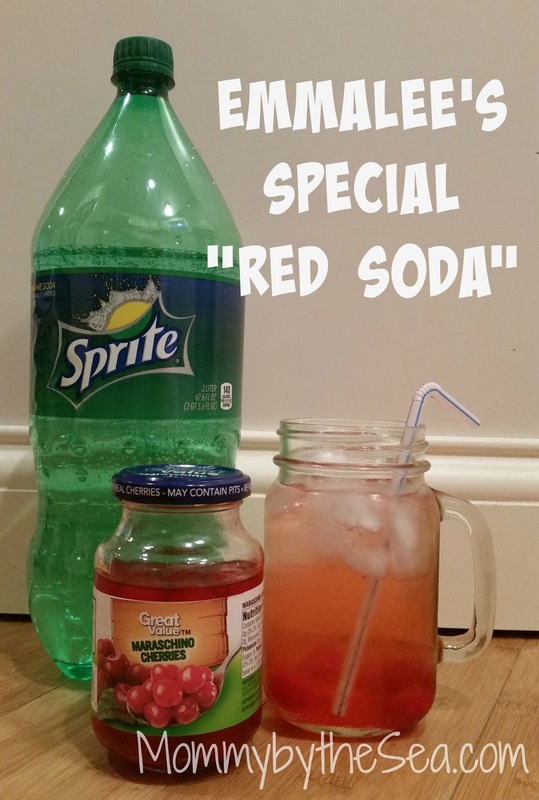 What's Special "Red Soda"? A Shirley Temple! So we headed down the soda aisle and grabbed Sprite and some maraschino cherries. We went back towards the deli and grabbed the pizza, a fully cooked rotisserie chicken, and a 2 lb tub of coleslaw to go with! 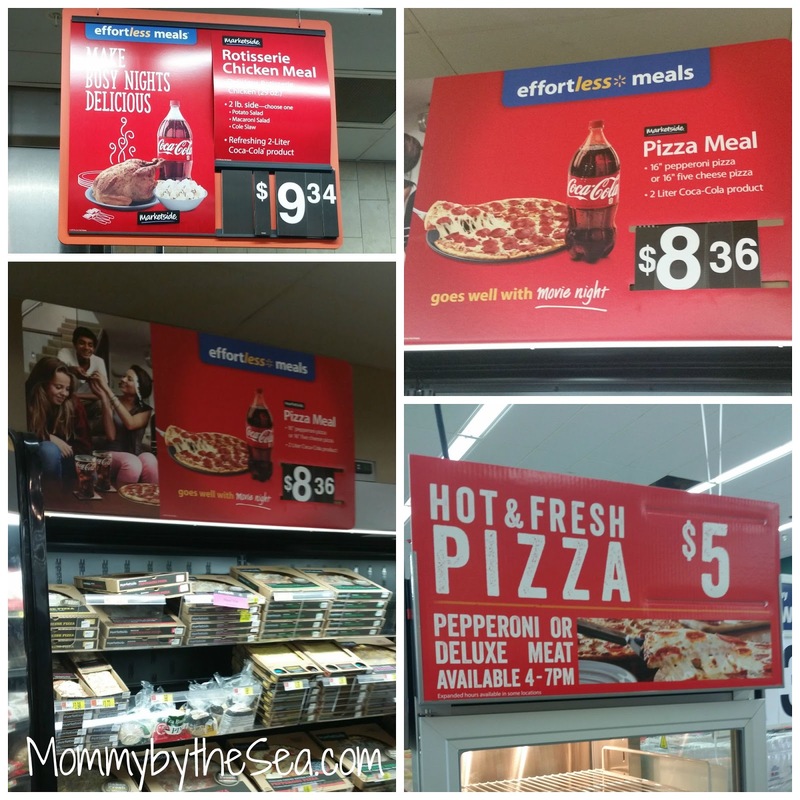 The bright red Effortless Meals signs made it really easy to find the components for dinner! So easy! Our favorite effortless meal with a rotisserie chicken is just some chicken with some veggies and a side of potatoes or pasta salad, but that night I really wanted something barbeque, so I decided to make our BBQ Chicken Quesadillas that the kids love! They are so easy! A side of coleslaw made it a perfect, effortless meal. 1. Remove chicken from the rotisserie and shred with fingers. 2. Place a spoonful of BBQ sauce on the tortilla and spread on one half. 3. Add 1/2 cup of shredded chicken on top of the bbq sauce. 4. Sprinkle a 1/4 cup shredded cheddar cheese over the chicken and fold in half. 5. Cook in oven at 350* for 10 minutes or until cheese is melted and edges start to brown. You can play with the ratios of your quesadillas! I don't like much cheese but you can add more! want more chicken, add it! I like to dip my BBQ Chicken Quesadillas into Ranch dressing but it's up to you! It might seem strange, but I also love dipping pizza into ranch dressing! On Thursday, I made Walmart's super easy, super delicious cheese pizza for dinner. I paired it with some raw veggies and a cup of ranch dressing, of course, and the kids loved it! I don't cut my pizza the normal way either... we make pizza dippers! So much easier for the kids to hold! Two, simple, effortless, delicious dinners that were easy to make with only 1 trip to the store! With our busy back to school schedules, I know I'll be making both meals more often! There are so many more ideas on their website, which do think you'll try first? Disclaimer: these toys were provided for review purposes but all thoughts and opinions are my own. There are very few companies where I love every single product that they put out, but VTech has accomplished that feat. I was lucky enough to see some of the really cool toys coming out for the holiday season at Blogger Bash, and I am thrilled! With two kids, three years apart of opposite genders, it is so easy to get caught up in all the different toys. 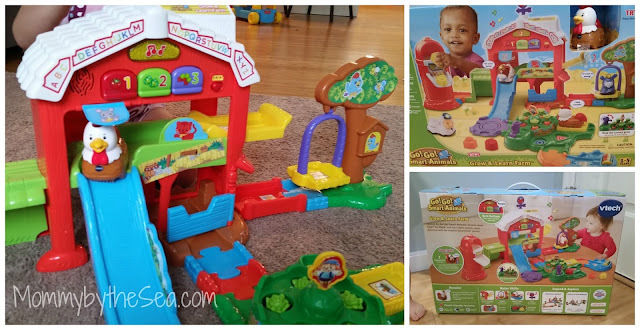 VTech makes my life so much easier by creating toys that spread across the age gap and are enjoyable for both my son and my daughter! Rather than buying them each a toy that only they like, I can get away with buying them each a toy that they like, but that the other likes too! It's like a two for one! Last year, we had the chance to play with the new Go! Go! Smart Animals right when they came out and we've quickly accumulated a lot more! We were thrilled when VTech asked us if we wanted to check out the new Go! Go! 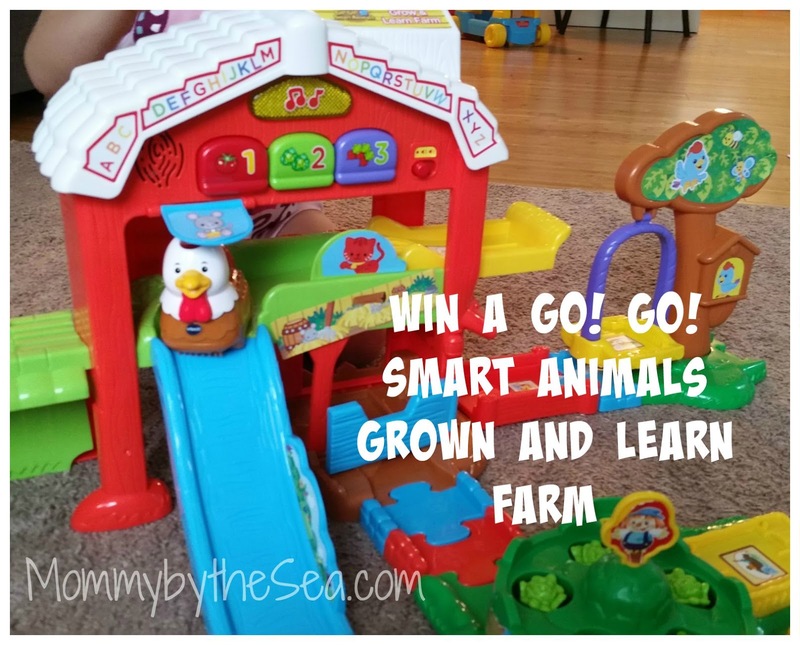 Smart Animals Grow & Learn Farm. 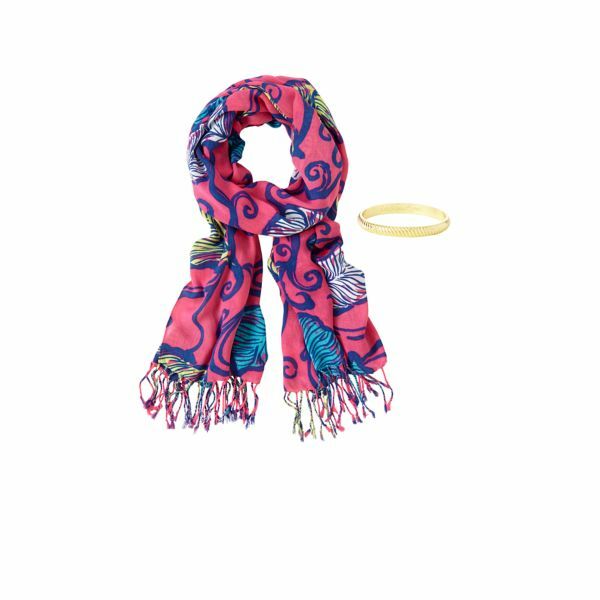 We love it and it fits seamlessly in with our other pieces! The Go! Go! 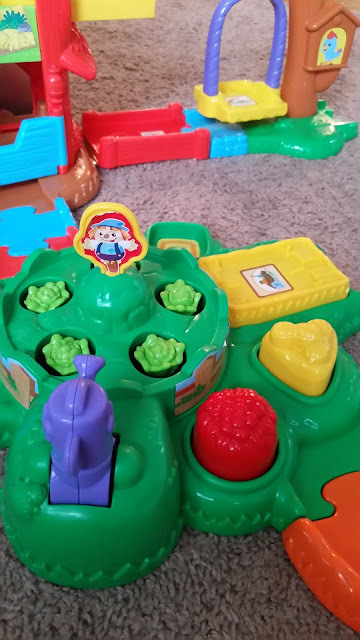 Smart sets can be connected together for hours of play and I love that both kids want to play with it! 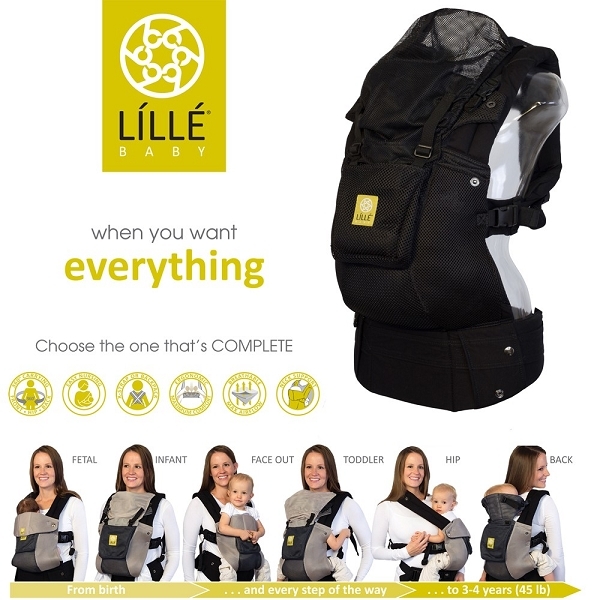 Designed for 1-5 year olds means that one toy can, and will, keep both kids happy! The Go! Go! Smart Animal Grown and Learn Farm has 7 Smart Points and the rooster plays music, sings songs, and says phrases, while the colorful barn introduces the 1 year old to colors and shapes, while it helps the 4 year old with her alphabet! While Tyler loves pushing the (included) rooster in the swing, the cutest part of the set is the growing garden! It's Emmalee's favorite part. She "waters" the plants by pushing the watering can and they slowly grow! We've already been looking at other pieces we can add to the set this holiday season, including the stable and the wagon. I just know that on Christmas morning, there will be VTech Go! Go! Smart Animals and play sets everywhere! 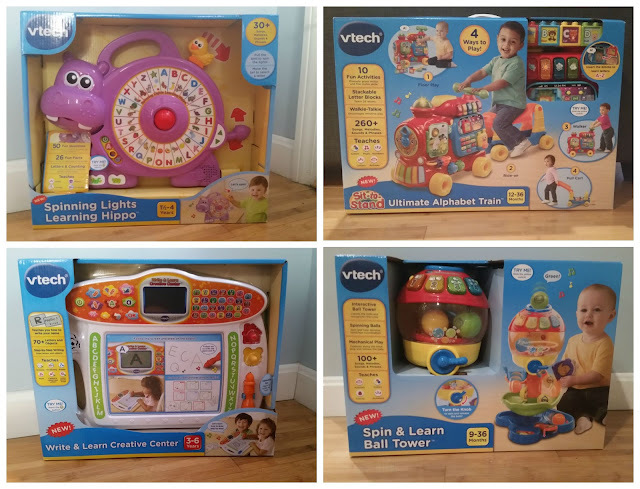 VTech Toys wants to give you a jump start on your holiday shopping with a chance to win a set yourself! Enter below. Only open to US residents. 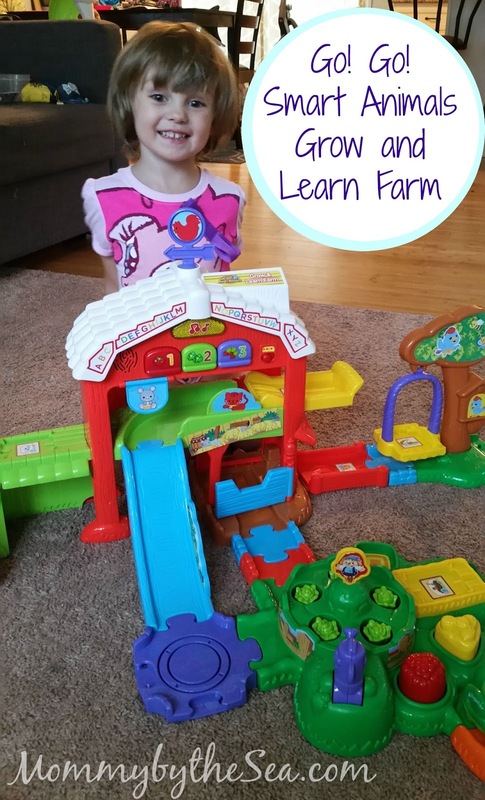 Afterwards, be sure to check out the other great toys that VTech has on their site, like the Spinning Lights Learning Hippo, Ultimate Alphabet Train, Write and Learn Creative Center, or the Spin and Learn Ball Tower! Summer is officially over but that doesn't mean the fun has to be over! We obviously won't have as many opportunities to be outside; the beach and splash pad are done for the year but we're always looking for indoor activities that will bring us through the winter! 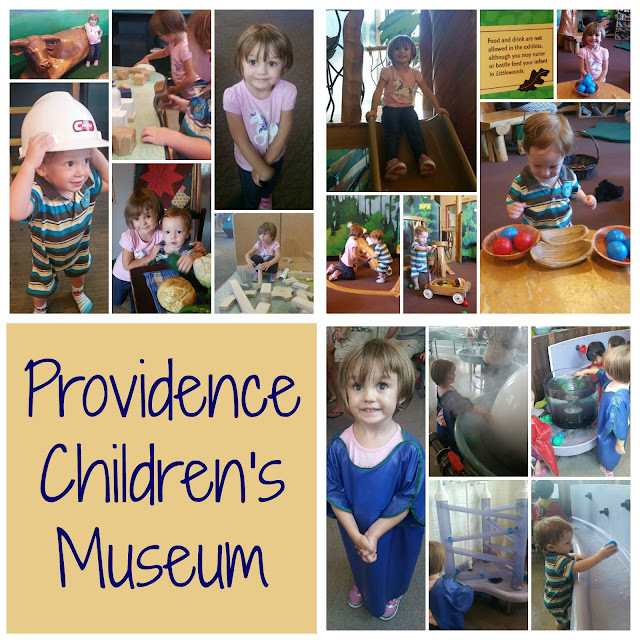 We love The Cape Cod Children's Museum but figured we could try out another so we grabbed some library passes and headed off to the Providence Children's Museum! 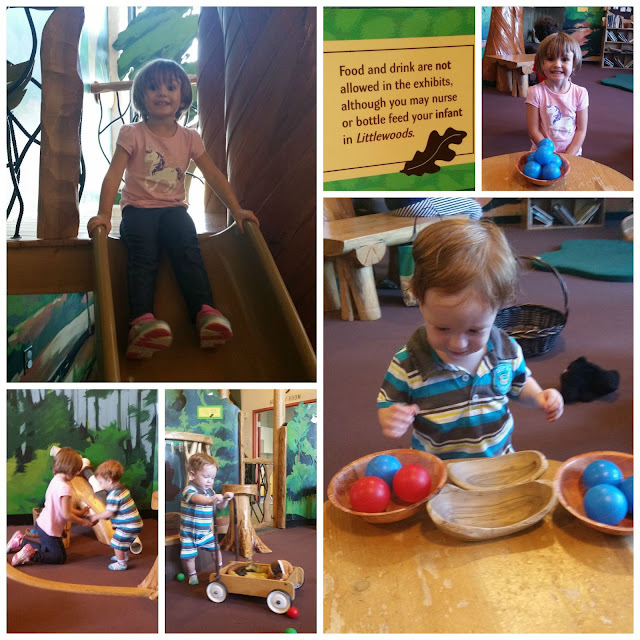 The museum is only a short 20-30 minute drive away and is perfect for an afternoon. There are many exhibits, including Magna-tiles, wooden blocks, complete with hard hats, a Space area, historical "rooms" that show the developmental time periods of Providence, and a boat that they can pretend to steer! We have three favorite areas. The first is the under 4 room call Littlewoods. It's a gated area designed just for smaller kids. There are marble ramps, a "cave" tunnel, and a "tree", complete with slide! Open daily, 9:00 AM to 6:00 PM, and select Friday evenings until 8:00 PM. Open Tuesday - Sunday, 9:00 AM to 6:00 PM. Open select Friday evenings until 8:00 PM. Closed Mondays except holidays and public school vacations. Closed Thanksgiving Day and December 24 & 25. 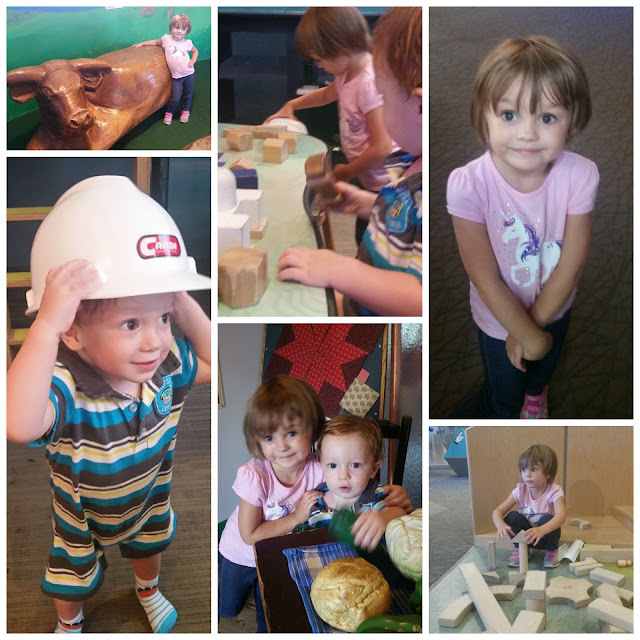 And be sure to check out the local library-- we saved money on admission with a FREE discounted library pass! Disclaimer: I was provided a Bubble Fantasia to facilitate this review, however all thoughts and opinions are my own. Like all small children, my little ones are obsessed with bubbles. I've grown to despise bubbles because of it. They constantly get mad because I'm not blowing the bubbles fast enough, and then when my 4 year old tries, either the wand is inside the jar and she can't get it, or she's dumped half the jar on the ground or on herself. Someone is usually very upset by the end of bubbles. Some days it's me and some days it's her. Needless to say, I was THRILLED when I saw the Bubble Fantasia at Blogger Bash in New York over the summer. Billions of bubbles in seconds. It was a dream and I knew I had to have it! I can't even put into words how excited Emmalee was when it showed up! We were outside 5 minutes later getting it set up. While it was extremely easy to set up, it took 8 AA batteries! We only had 6 so we did not put batteries into the base which allowed the machine to operate 360 degrees, but since we were blowing the bubbles off the porch into the yard, it worked out just as well. Both kids loved the bubbles. There were so many and they had a blast running around trying to pop them. I loved that I could sit there with being yelled at for not blowing them fast enough! 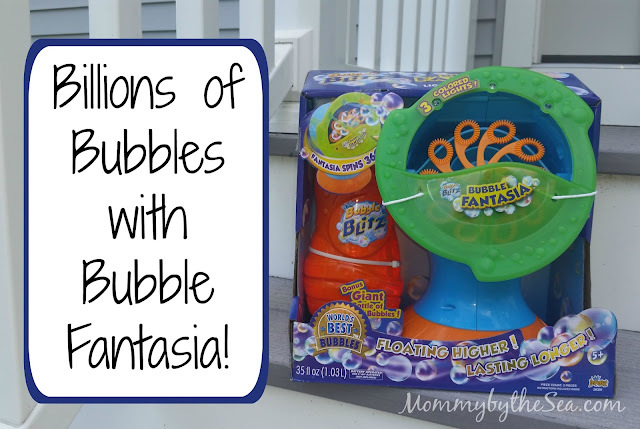 The Bubble Fantasia offers 3 colored lights that flash in addition to 360 degree spinning base but the toy is just as fun if you are like us, and short a few batteries! School is definitely in session again and we're back to laying out clothes and packing lunches before bed. Unfortunately, the snacks meant for school, were disappearing before they could get into lunch boxes so we had to do a quick run to Target to pick up some more lunch packables! We like to stick to better for you options like applesauce, fruit and granola bars. 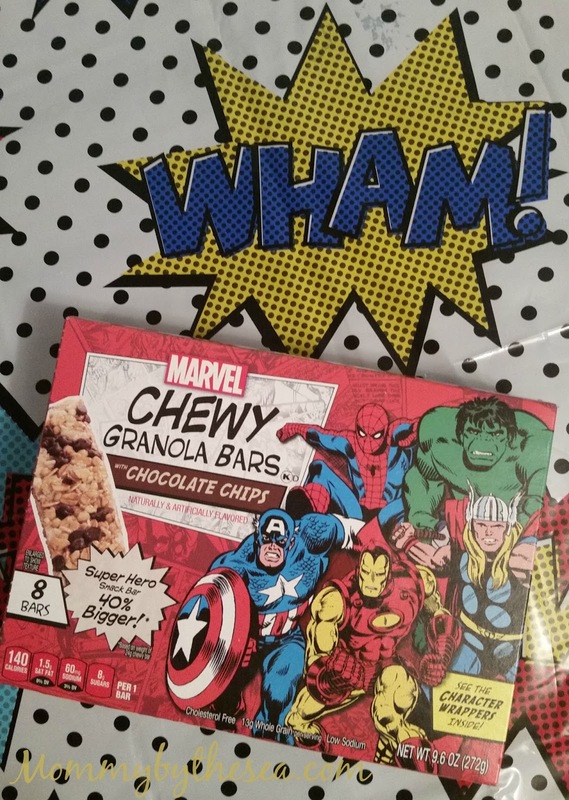 Imagine Emma's excitement when she saw her favorite MARVEL superheroes on her granola bars! We're big MARVEL fans and Emma tried to smooth talk me into buying them so that she could "get superhero powers too'! I must admit though, it was an easy sell, they are nutritious, affordable and come in chocolate chip and peanut butter chocolate chip flavors! Emma's school is peanut free so we grabbed a couple boxes of MARVEL chocolate chip chewy granola bars and started to head out, however, I was met with cries of "Can we please have a movie party?!" as we walked by the popcorn section. Being back at work everyday has absolutely cut into my fun time with her and her brother so I was happy to oblige to a movie theater night! We added some chocolate candies, MARVEL themed flavored waters and popcorn to the carriage and headed home. A couple nights later we set up for our movie night and had a few friends over. 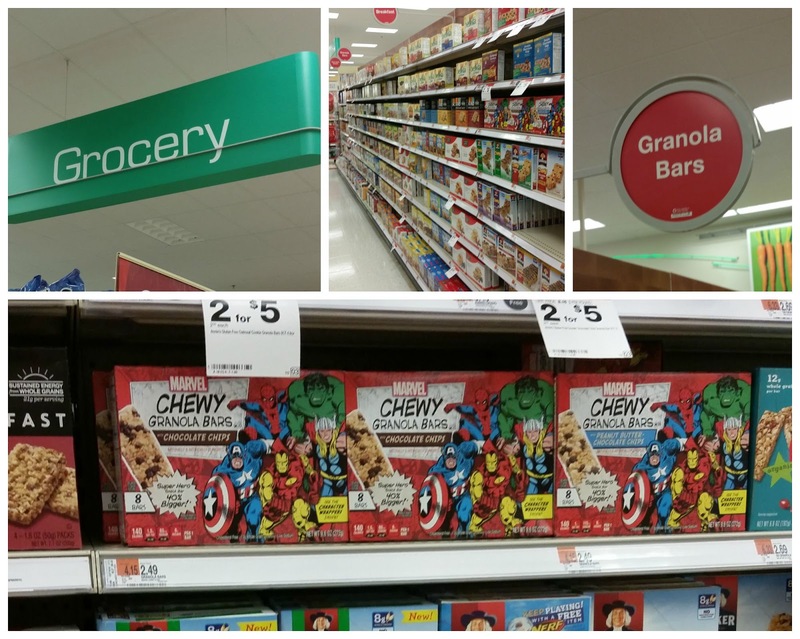 I loved having healthier snacks to offer our guests and everything looked amazing on our superhero table cloth! 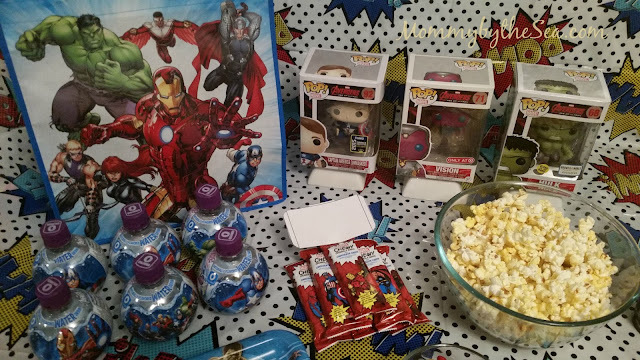 Because we're lovers of all things MARVEL, I added a reusable shopping bag and some collectible toy figures that we owned to the table to make it even more super! Dave pretended that his granola bar was Thor's hammer, and even went as far as printing out the top of the hammer to tape to his bar! MARVEL Super Hero Snack Bars are 40% bigger than the average granola bar (normally 24g), which definitely made them feel more super! I also loved how each bar had a different character on it! 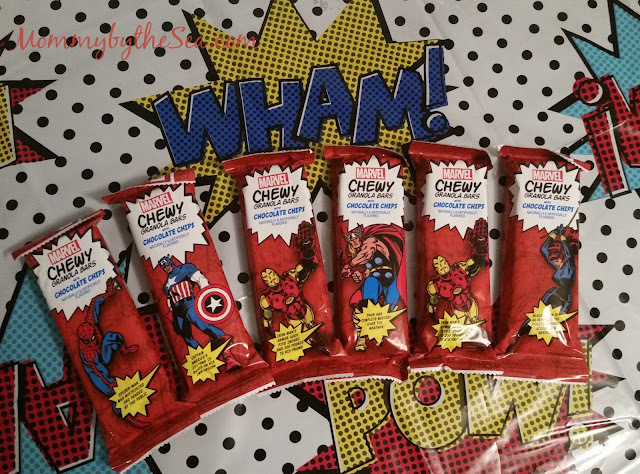 There are six different wrappers: Captain America, Hulk, Spider Man, Iron Man, Black Widow, and Thor. I was a bit sad that we didn't get the Hulk in our first box, but we did get the other 5 characters! I grabbed a Spider Man, David had a Captain America, and Emmalee, of course, chose "the girl": Black Widow! On the back of the box, there is a collectible card you can cut out as well! Each box has a different card and there are 4 cards total: Hulk, Iron Man, Hawk Eye, and Spider Man. I may have chosen this box because it had Spider Man; he's always been my favorite! Emmalee had a blast at her superhero movie night and I was happy to have snacks that were both nutritious and delicious! 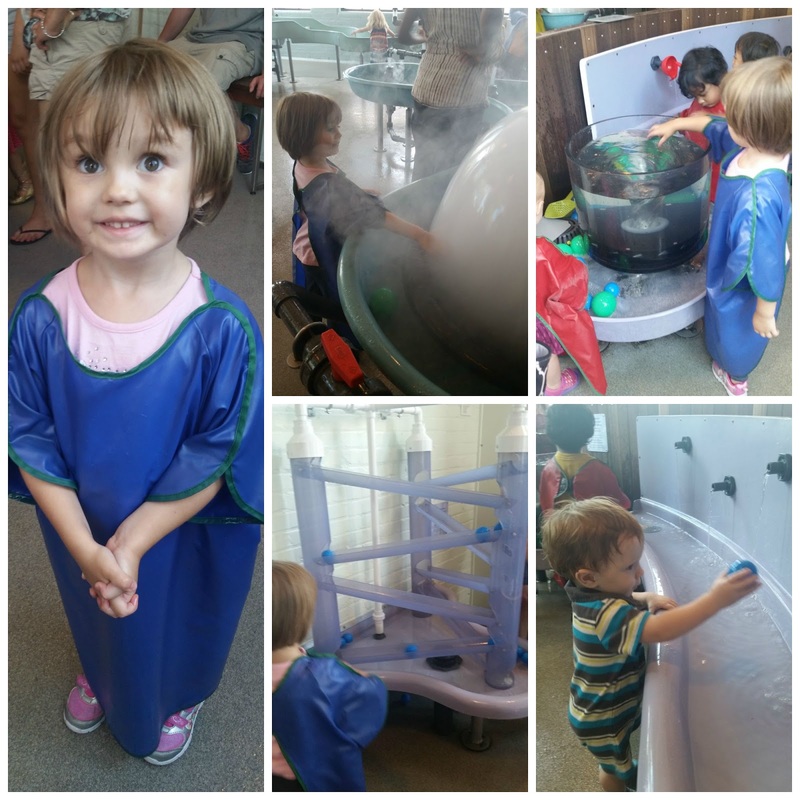 Our guests had a blast too! 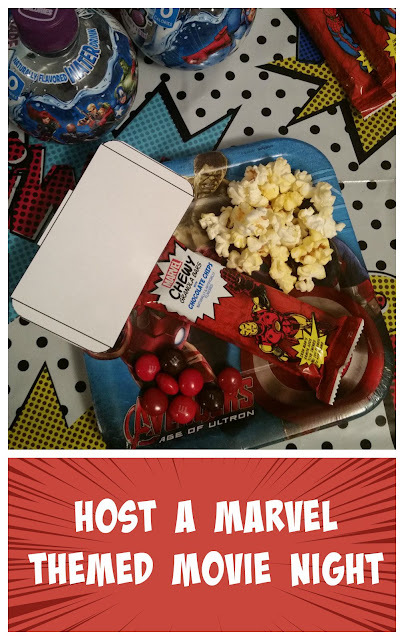 The MARVEL theme was a hit with both children and adults and the few leftovers we had made their way into Emma's lunchbox for Monday! We had a blast at our Movie theater night, but I'm also loving all the super ideas at the MARVEL hub. You'll have to let me know which ideas are your favorite! I'm so late getting this up but David and I celebrated our FIVE YEAR wedding anniversary last month, which is crazy when you think about how we only knew each other for 6 months before getting engaged, and only waited another 8 months before getting married! And no... I wasn't pregnant, but we did end up getting pregnant with a honeymoon baby and she was born 10 months later! We wanted a really special night and were thrilled when we found out that Zac Brown Band was going to be playing at Fenway Park on our actual anniversary! We immediately stocked ticketing and after snagging 3rd row floor seats (!!!) we decided we were going to make a whole night of it. We secured a babysitter, well two... one for the evening and one for overnight, and then booked our hotel. 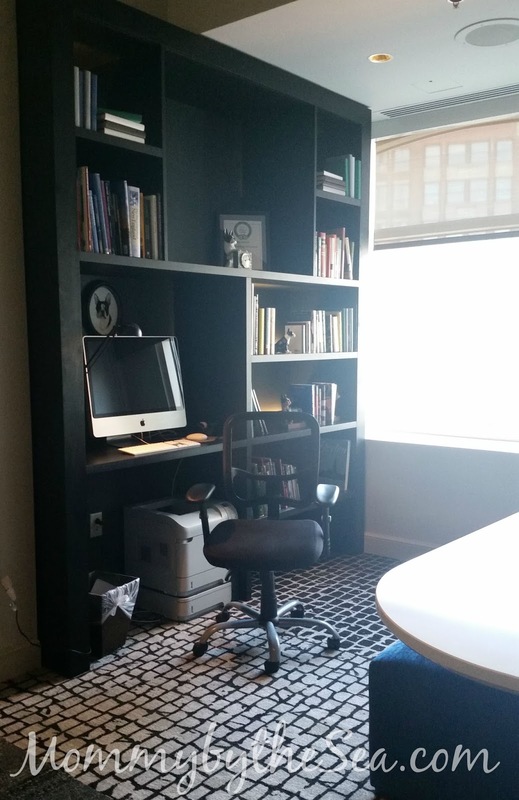 We found a great rate for the Hotel Commonwealth, which is just a quarter of a mile away from Fenway Park which meant we could walk to the show! 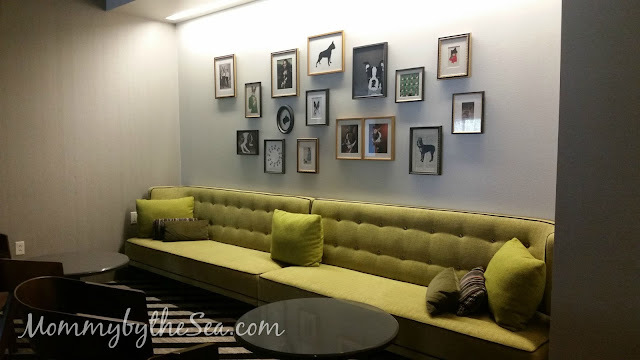 The Hotel Commonwealth is a luxury hotel and I only mention that because most of our hotel accommodations fall under the $100 per night mark... we don't usually do fancy, so when we pulled up outside The Hotel Commonwealth, I was already in awe of the gorgeous building. The gorgeous lobby area and the help at the front desk were even more amazing. We had an amazing woman named Felicia take care of us. She was warm and personable, welcoming us, asking if we were staying for the concert. We mentioned that we had gotten tickets for our anniversary and it was our first night away together since having our daughter four years ago. She joked that we definitely needed the night off together and to enjoy, mentioning she could put us down for a late check-out if we wanted the morning to relax. We declined, said thank you, and were off to the room. Our room was beautiful. The best part was that they could accommodate our request for down-free bedding as Dave is allergic, but what really made me fall in love was when Felicia called from the front desk to make sure the down-free room was up to par, ensuring that they were the correct down-free pillows. It only took a second to call us but it left such an impression. We headed out for dinner and the concert. We ended up at Yard House down the street and the concert was just amazing. I have no words for how much I love the Zac Brown Band. After the show, we wandered to a couple of local bars and ended the night at the hotel's Island Creek Oyster Bar for one last drink. Ready to head to the room for the night, we were entirely caught off guard by the bottle of champagne that was left for us, with a sweet note from the greatest guest service person I've ever met, Felicia, the front desk lady. A little special treatment from @hotelcommonwealth. ❤ Along with a handwritten note from the guest services girl who checked us in, remembered it was our anniversary even though it was just in casual conversation and I'm a #hotelcommonwealth fan for life. You HAVE to stay here! I was blown away by The Hotel Commonwealth. Between the walk from the Kenmore train station (literally right outside the station! 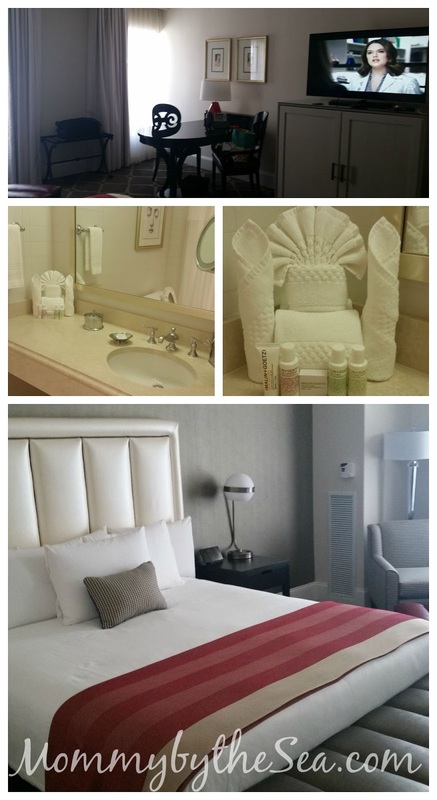 ), to the gorgeous decor and amazing staff, to the walking distance of Fenway Park and tons of great restaurants, it is hands down, the best hotel we've stayed at. 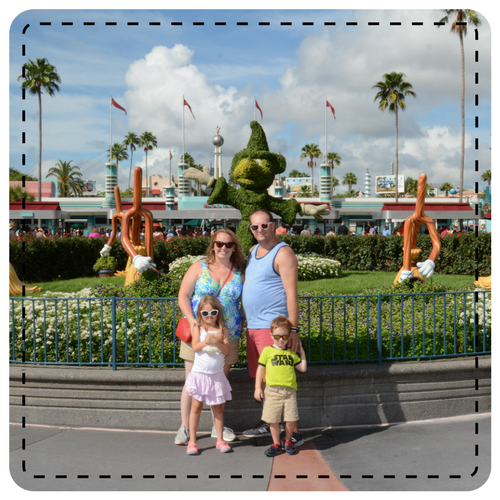 We're already considering next year's anniversary trip! I love when I hop on the Lilly Pulitzer website only to see new prints have been released! Here are all the new prints in items that cost less than $ ! I think my favroite is the White Pack Your Trunk. I can totally picture it was a pair of dark jeans and some tall cognac boots for my New England Fall weather. 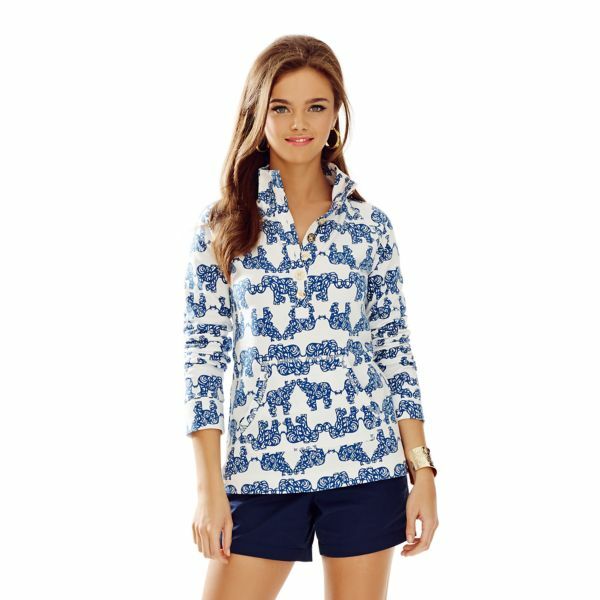 What new print is your favorite? After years of saying "I have found the perfect planner", I really did. For the past year I've been using a month only calendar because I really like to see the full week all at once and since I'm a linear type of person, the stacked on top of each other weekly views just hurt my head. Unfortunately, even with an 8.5x11 planner, the monthly boxes are too small to fit in my school plans, the kid's plans, blogging reminders, and even meal plans so I knew I needed something else. 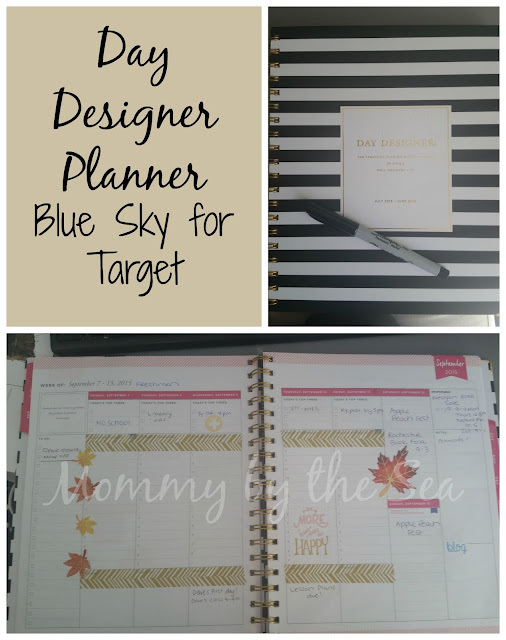 I fell in love with the vertical weekly layout from Erin Condren, but the Day Designer for Blue Sky offers the same layout at a fraction of the cost; like $15 compared to $50. Wow! Let's start with the cover. It is oh so Kate Spade-ish with it's chic black and white stripes and gold coil. I really want to monogram it but I'm nervous about it throwing off the chic-vibe going on. The first few pages offer some great goal setting pages. I'll probably add in my Teacher Evaluation goals so that they are close at hand, but otherwise, I don't see me using this part often. The vertical weekly planner is broken down by day and then again by hour, but that's a little much for me so I've just been using washi tape to cover over what I don't need! I love that for each weekly spread there is a column for to-do's for the week, an inspirational quote, a place to focus on gratitude and a place for notes as well as a spot to look ahead to next week. Add in a Top 3 at the top of the page, which I've converted to my meal plan area, and a Tonight section at the bottom, which is where I keep track of my steps, and this planner gives me plenty of space to keep all of my life organized! I really hope that this planner is released again next year because I have finally fallen in love with just one planner. ...and speaking of love, I am obsessed with this trend of planner decorating. Washi tape, stickers, vellum, you name it. It's satisfying my scrapbooking itch while being completely practical. Send me washi and stickers please? Kthanks.